It is the procedure in which patient undergoes the transplant surgery more than one time means to revise his first transplantation. 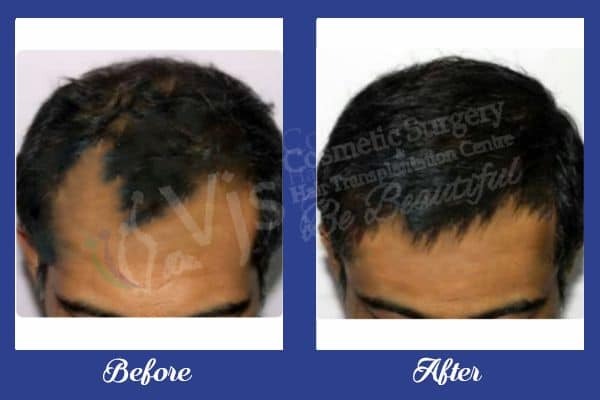 With the long way journey of hair transplantation, techniques used for this surgical procedure are getting better and so the demand for the revision hair transplant in Andhra Pradesh is increasing. If the patient is happy with the first hair transplant but now want more grafts. If the patient is not satisfied with the first hair transplant procedure. However, patients remain confused about whether they could get 100% success and guarantee of results or not after revision hair transplant. It is possible to get the expected results even after the revised surgery of transplantation but the results can vary according to the condition of donor area, prior hair transplant results, care, smoking and drinking habits and many other such factors that can hamper the success ratio of results. In this case, patients after punch grafting procedure go for revision surgery to get expected results and to hide the scars given by the first surgery. In this procedure, surgeon has to check the possibility of scalp to scalp transfer as after punch grafting donor area may weak. So in this case body hair transplant can be recommended. Some time patients could get the weird linear scar after the FUT surgery so to hide the scar patients go for the surgery again. Surgeon can recommend to you another strip or FUE surgery depending on the expectations and reasons for getting another surgery. Sometime even after the FUE surgery patient can go for the revision surgery as he may get bad hair transplant due to the ill practice of the inexperienced surgeon. In some cases surgeon do the overharvesting of grafts; even do not care about the orientation and the implantation of follicles at the correct angle so after surgery patient could not get the natural look. Sometime patients could not get the permanent results after surgery so he has to go for surgery again. Sometime mistake can be at the patient’s end as poor eating habits, smoking and alcohol consumption can hamper the healing process after surgery. Even patients sometime do not bother for post operative care so lead to bad results of surgery. Patients can go for the revision hair transplant after 12-14 months of their initial surgery means after the proper recovery from the first surgery. This revision surgery can be done through FUT , Unit by Unit Technique or Bio – FUE depending upon the specific factors as explained above. Revision hair transplant cost also depends upon the expectations, procedure and many other factors.